Thank you to all that came to my readings in the Bay Area. I can’t tell you how happy it made me to look out at familiar faces while reading from my new book, Gone Feral. And I’ve gotten to meet some new friends, too, including a woman who dated my dad in the late 1970s. She told me she had been thinking about her old boyfriend George Carpenter and so she googled his name. My reading came up in her search. Of course she lives in Berkeley, right where I was having a reading. Priceless. I’ve been learning about myself too. 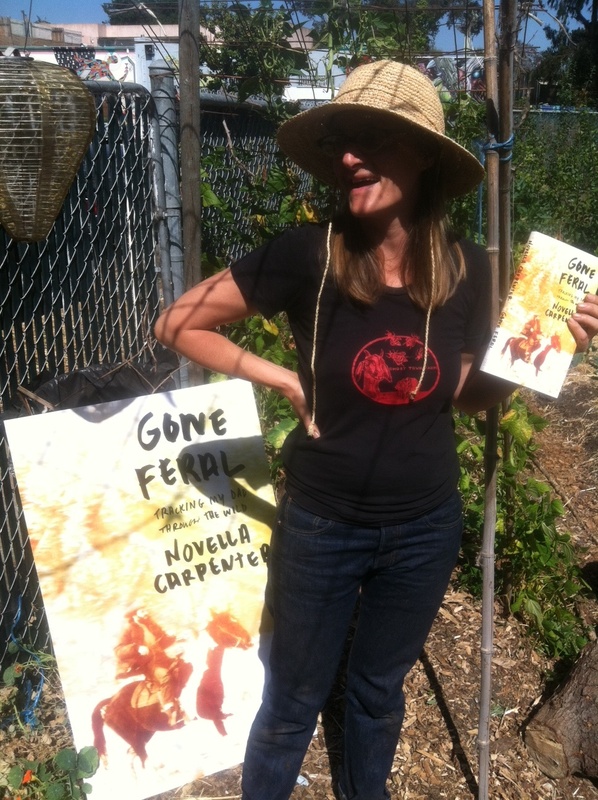 One woman at the SF reading at Omnivore Books told me she was so surprised at the difference between me reading from Farm City and me reading from Gone Feral. “You were so…strident last time I saw you read,” she said, “Now you seem so vulnerable, so soft.” It’s true, I was a little weepy that night. The two books are very different, I’m not so heroic in this latest one. It feels good to admit that I’ve had a tough life, that I’ve made mistakes and that I’m just human. Now my sister and niece are coming to America to go on a great roadtrip/book tour. We’ll be camping in the redwoods, staying at Pholia Farm up in Ashland (Nigerian goat farm and cheese making paradise), before doing a few readings up in the PacNW. Like I said in my last post, I’ll be reading in Portland (Powell’s) June 30, Seattle (Town Hall) July 1, Olympia (Main public library) July 8, Moscow, ID (Bookpeople) July 10, and Eagle, ID (Public library) July 15. We are also going to go visit my dad and our birthplace of Orofino, ID. When my sister and I get together, strange magic tends to happen so I’m thinking this is going to be epic. If you missed me in the Bay, there are future readings in the making for the months of September and October, so stay tuned. Until then, see you out in the wild. This entry was posted in Gone Feral. Bookmark the permalink. I am almost finished with your book and I love it! I am recommending it to my friends, some who had an unusual parent like you, and others who wish their parents were more a bit more interesting. Thank you for sharing your story. Sounds like an amazing read, I’m really looking forward to picking it up. I read your book in two days. It was a tribute to childhood and father and daughter relationships–regardless of our many challenges. I put it down several times and thought of my dad who passed 7 years ago and my childhood. Thank you, Novella. Love your new book. Can relate to your life’s journey in so many ways. Have fun with your book tour. Look forward to reading your future books. Finished your book today amid trying to go about my business! Finally just flopped on the bed, surrendered and gobbled it up. Then when I took a look here it appears you were in town yesterday (Portland) Crap! Sorry to have missed the chance to hear/see you.Thank you for sharing this part of your life with us. I read your book in one setting – please keep on writing! Hello Novella, this will sound strange but my mom Gail used to babysit you and your sister in Orofino when you were very little and she knew your folks pretty well. She is a librarian in California now but she sends me your books. I was born in McCall where my dad still lives and I really identified with Gone Feral. Blessings to you and your family. An extraordinary memoir. You should be very proud of it.